It started as a way for local mountain bike riders to get together and ride, but at the time no one had any idea it would last as long as it has. 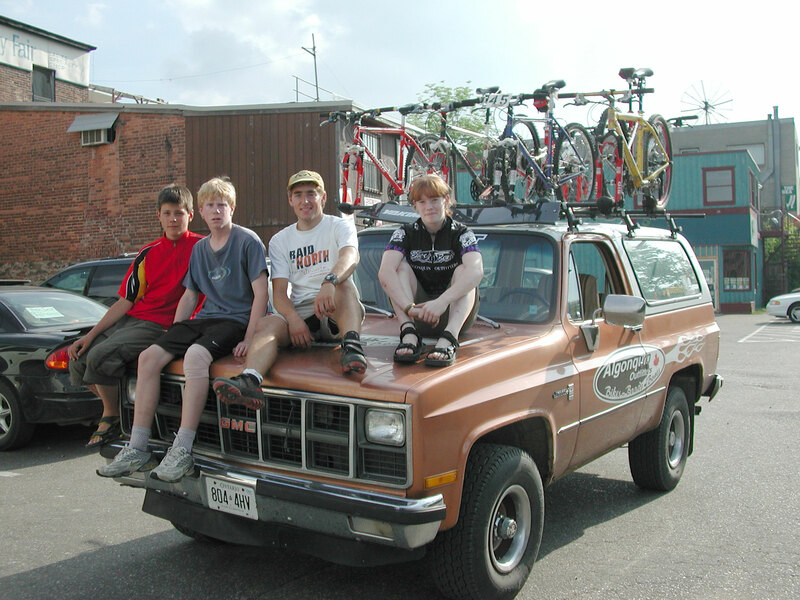 Since about 1992, Algonquin Outfitters has hosted a weekly group ride, welcoming anyone who wanted to hit the trails with like-minded mountain bikers and providing support along the way. Bob Sutcliffe and Al Cronk have been there from the beginning, as have a handful of others. A small group of mountain bikers had been riding a lot together back then, says Sutcliffe, but as they got a bit older and began to juggle careers and families, they were finding it harder to just spontaneously get together. “We set a night so that everyone knew when to show up,” says Cronk. Tuesday was as good a night as any and whoever could make it just showed up – on a typical night, there would be eight to ten riders, fewer in the early and late season, more in the summer months. Over time it grew with some coming to try it out and finding it wasn’t for them – maybe because its not about racing, maybe because they had other commitments – while others come back time and time again. In the summer, cottagers often join in the fun too, some from other provinces or countries. The rides start in the spring – “We start when Al Cronk says it’s time,” laughs Sutcliffe – and run through until late fall as weather and trail conditions permit. The group rides a variety of trails in and around Huntsville, travelling 15 to 20 kilometres a night. “It’s nice riding,” says Cronk. They have occasionally made trips down to the Buckwallow trails in Gravenhurst or to the Echo Valley trails in Lake of Bays, too. If you want to participate, drop into the Algonquin Outfitters Bike Shop to introduce yourself – staff can give you more information about the rides and help you determine whether your riding experience would be a good fit for the trails. Everyone is welcome, though they recommend that participants be older than 15 – younger children may not be able to keep up with the group. “It’s a fun night for people to meet, and to promote mountain biking,” says Sutcliffe. There’s a lot of camaraderie and people new to the group are nurtured. So if you’re a beginner, don’t let that deter you. “We have one rule: we don’t leave anyone in the bush,” says Cronk. Algonquin Outfitters staff carry equipment and supplies like extra tubes and wrenches so that if someone has a mishap on the trail, they can usually fix them up so that they can ride out. Brockett joined the group as a way to push herself to ride more, to improve her technical riding skills, and to learn about the trails in and around Huntsville. The terrain is classic Muskoka – hilly and there are technical aspects to the trails – but Brockett says that riders joining the group ride for the first time mostly just need the endurance to handle the hills and distance. And all riders are encouraged to meet after the ride at On the Docks Pub, which has been supportive of the group over the years, says Sutcliffe. That extra social time has helped to cement the camaraderie of the group. “It’s nice to ride with friends and afterwards we always slip next door into the pub to rehydrate because hydration is important,” laughs Cronk. Sutcliffe says that he can’t believe how fast the time has gone by, and that many of those first members now have children who come out for the ride. “Do you think I’ll be riding in another 25 years?” he laughs. Maybe, or maybe not, but there’s a good chance those children and others will be carrying on the tradition of the Tuesday night rides.